LA Weekly has a story this week about a family's search for their missing relative, Jeffrey Keith Joseph, an "L.A. man on probation for running a rogue pot shop in Venice." 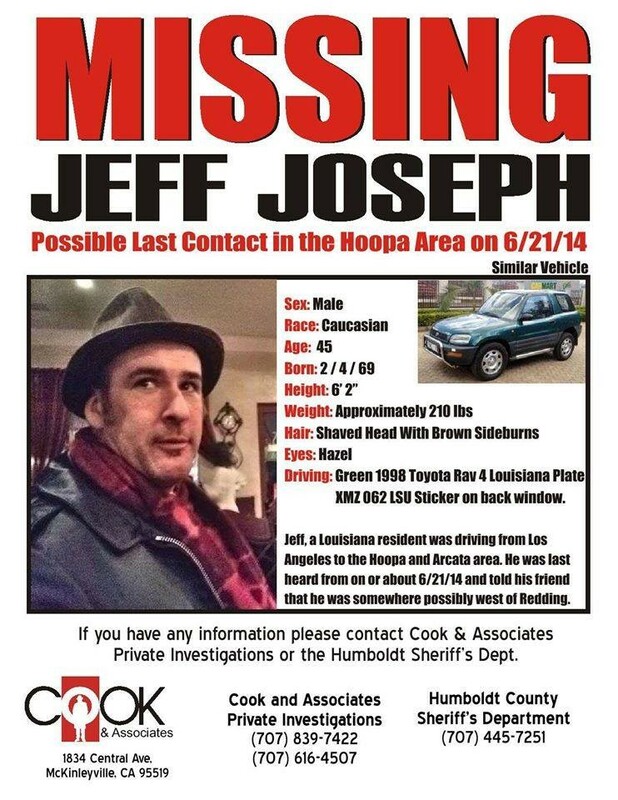 Relatives fear Joseph might have disappeared on a trip to Hoopa, judging by calls made on his cell phone, including the last one placed on June 21 that phone records show pinged off a Hoopa-area tower. "There's lawlessness up there. People get killed. There's so many missing people up there. They just vanish. ... Regardless of whether or not he was doing something wrong, we don't want Jeff to look bad. He might be dead. He didn't deserve to be murdered ... I don't have much hope that Jeff is alive. That's my own gut instinct as a sister." Joseph's family has created a Facebook page, Jeff Joseph Missing.